Waiters can tell from the look in his eyes that "he knows this is it." 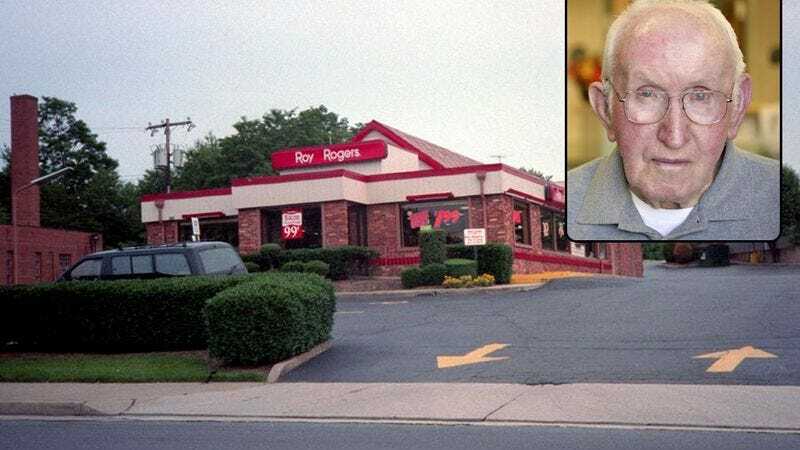 ALLENTOWN, PA—According to morning-shift employees at the Roy Rogers restaurant off Route 114, the elderly man seated alone in the back corner booth appears to be intent on dying there. "He came shuffling in really slowly this morning and just sort of slumped over there in the back," said cashier Brianne Pecor, 17, who claimed the old man has ordered nothing in the past two hours but a small cup of coffee. "It's pretty heartbreaking to watch. Guess the poor old guy doesn't have much of an appetite left. He's probably just looking for a calm, quiet corner where he can curl up and pass away." "They can sense when their time is coming," Pecor added. "They just know." The frail-looking senior citizen has reportedly been sitting alone, unclaimed, for the past few hours, during which time restaurant sources said he has hardly moved. Although the man chose to settle at a partially concealed table in the darkest corner of the restaurant, workers told reporters that the figure has been impossible to ignore, largely due to his labored struggles for breath and frequent hacking coughs. "He let out a really heavy sigh a little while ago, so Brianne went over to check on him," said morning-shift manager Dan Plumley, 36. "But he kind of turned his head away and cowered a little when she approached him." "At this stage, it's probably best to just leave him be," Plumley continued. "Let him go in peace, you know?" Since arriving at the Roy Rogers location some three hours ago, the elderly man has reportedly taken only a few meager sips from his coffee, and has hardly averted his gaze from the restaurant's back window. "He's got a nice view from where he's sitting," Plumley said. "He can see the trees rustling in the breeze out past the parking lot, and he can watch the cars go by on Benton Road. I think it must really be a pleasant, soothing sight for him." Added Plumley, "A nice way to go." Roy Rogers patrons have also reportedly maintained a respectful distance from the man by sitting at booths and tables on the opposite side of the restaurant. When passing by the slumped figure on their way to the restroom, most have made an attempt to avoid looking directly into the senior's eyes. "It looks like he's dressed up for some special occasion or something, like he knew this was the end," said diner Matthew Brunelle, 44, referring to the man's polished leather penny loafers, neatly pressed brown slacks, and gray cardigan. "It makes you sad, in a way, but then again I guess it's all just part of the cycle of life." In an effort to make the senior's final moments on earth as comfortable as possible, the restaurant staff postponed mopping the floor around him and, when they noticed the old man's frail, arthritic fingers struggling to fasten the top button of his sweater, dialed the thermostat up a few degrees. At press time, employees of the Roy Rogers location claimed that if the man hadn't passed on by closing time, they would leave a little water and some chili out for him and then come back to check on him in the morning.